When I tacked JR up, I had a hat for him as well. It was Alibar’s old fly bonnet. I’ve had it for years and years. The only dainty thing on Alibar was his ears and the bonnet was too big so the ears sort of tipped over like a collie. Usually, I am comforted when I use Alibar’s tack on other horses. I feel like I’m passing along a little piece of his legend and perhaps a little bit of his game nature will rub off on whoever is using his hand-me-downs. 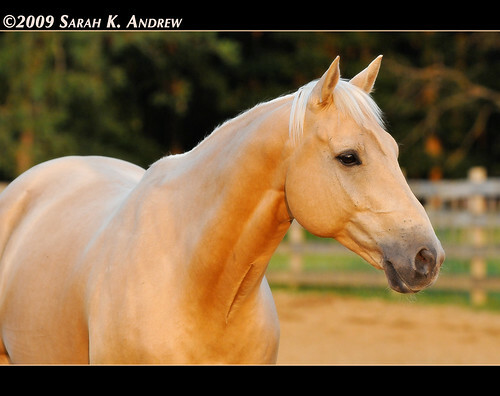 I use his old saddles, bridles, bits, and all of his saddle pads except for one special pad. But the hunter green and burgundy knitted fly bonnet stung me a little when I pulled it out of the bridle bag. In my mind, I knew JR and Wizard needed the fly protection that the bonnet would provide. The bonnet is well-worn and several years old. I did not want to put it in a box somewhere so I knew I wanted to use it, but it still felt strange to use it. The nice thing about horses is that they keep us flighty humans well-grounded. I put the holy bonnet on JR- he stood there and silently wore it like a horse does. There was no pomp and circumstance, no gasp of delight to wear such a relic. The maudlin moment was over and JR and I went out to work. There was a herd of deer crashing around in the woods next to the arena. JR reacted to the interlopers with youthful exuberance, bucking, snorting, and flagging his tail as I longed him. As I anchored the silly yellow horse’s circles, I wondered if he will do the same if I’m in the saddle when the deer run past us. Hm. After longeing, I spent a few moments on our mounting block work, circling him around me, fiddling with the saddle, stirrups, hanging over his back. He barely flinched. I kept it short and sweet. I mounted. He was awesome! 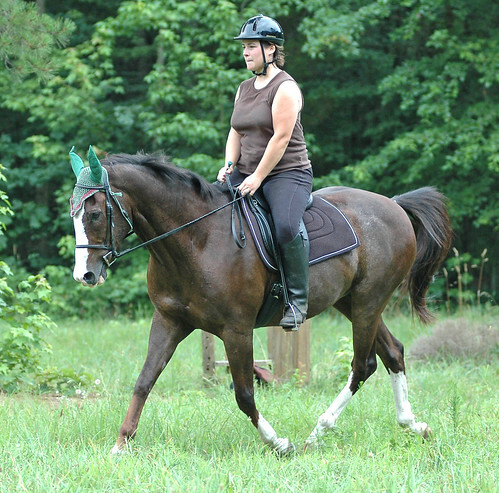 I did not spend a lot of time in the saddle, but I was very pleased with his demeanor. He was willing and responsive. Maybe Alibar’s hat dropped a little sense into his brain. Related in a pet loss way, When my beloved chihuahua died suddenly of Cushing’s Disease in 2004, I packed up all of her belongings that she loved and that were special to me. It still makes me cry to look through her stuff. To remember how much she loved her little berber bed, her fleecy toys, little silly things we got for her throughout the years…All of the funny, happy, and still painful memories associated with it all. I never, EVER thought to pass along any of her things to Max (our pomeranian) because he is very destructive. The thought of any of her belongings being damaged or destroyed is just devastating to think about. I suppose it would be different with horses as the items are just being used for a short while and then put away, but the memories are still there. And the risk of damage…? I don’t think I could do it. I guess I’m just silly like that. You’re a far stronger person than I am. Your instincts ended up being right about this. I cannot use the bonnet anymore. I was OK once but could not do it again. It has been retired and it lives in my childhood bedroom at my mom and dad’s house. I guess the hooligans will get their own special bonnet next time I go to the tack shop. I’m so sorry you lost your dog so suddenly. The memory of our pets is a powerful thing.